High Silica Fabrics : Kevlar Safety Product, Exporter of Kevlar Apron, Kevlar Hand Gloves, Manufacturer of Kevlar Leg Guard in India, Kevlar Cloth Manufacturer. Silica Fabrics content is more than 96%. 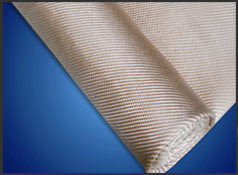 This Silica Fiberglass Fabric is suggested to work in 1000? and the working Temperature is in 1200? for long time, Melting point is 1700?. Silica fabric is an ideal materials for high temperature thermal insulation and electrical insulation. High Silica Temperature resistance Fiberglass fabric has wide applications, which are usually used in metallurgy, rocket building, aircraft building, ship building, car industry, atomic energy and machine building. Non-Pollution : Compared to Asbestos Cloth and Ceramic Fiber Cloth, Silica Cloth is harmless. High Temperature Resistance: Working Temperature is 1000?, Melting point is 1740?, recommended Temperature is 950? Low Electrical Conductivity : After Acid Treatment, Less Metallic Ion and Super Electrical Insulation.